Help hungry people tell their stories! A national inquiry is being launched into the causes of food poverty. With your support, we can organise events which ensure the inquiry hears directly from the people who have been made to go hungry and depend on food banks. MPs of all parties are holding an independent Parliamentary inquiry into the causes of food poverty, chaired by the bishop of Truro and Frank Field MP. With your support, we can organise regional ‘Hearing’ events where the users and staff of food banks give evidence to the inquiry. 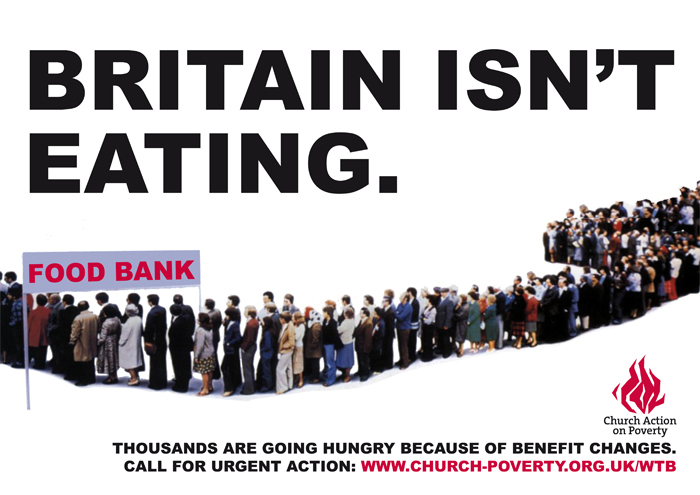 Together, we can make sure that politicians understand the terrible reality of hunger in the UK. Support us by pledging as little as £10 to help pay for regional hearings – click here to pledge now! Become part of the crowd. Find us on Facebook. Follow us on Twitter. Spread the word. Tell your friends. Buy a Gift Certificate for the appeal and offer something special to your loved ones and friends. This entry was posted in Food Fuel Finance, Food poverty, Give by Church Action on Poverty. Bookmark the permalink.